A rare great bustard that was released in September on Salisbury Plain has been spotted about 50 miles away in Dorset. The bird was seen on farmland owned by The National Trust near Langton Matravers in south Purbeck. It was a young female that was released as part of a 10-year project that began in 2004 to reintroduce the great bustard to Britain. The native population of the bird was hunted to extinction in the 1840s. 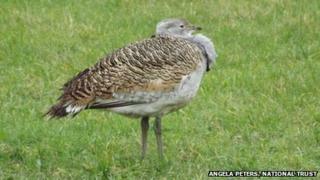 The RSPB said bustards do occasionally visit Dorset as they head south in the winter. Spokesman Jon Bish said the bustards taking part in the project were radio-tagged to identify them. He said: "It's very exciting because these birds are incredibly rare, so it is a real privilege to see one in Dorset."